Sorry Mohammed, but I really didn't want to tease you. Don't worry, be happy. But first of all few preliminary tests for the most favorable handling were necessary. 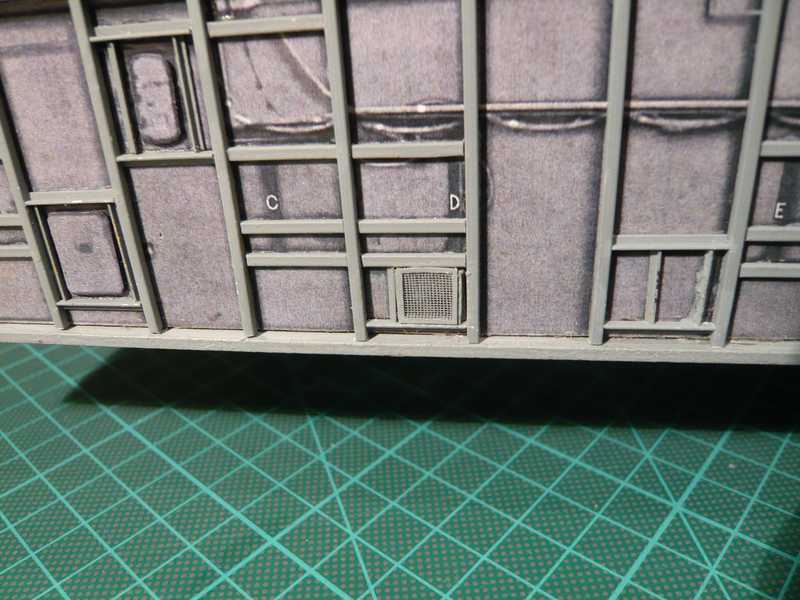 In the final version I cut first the internal window opening of approx. 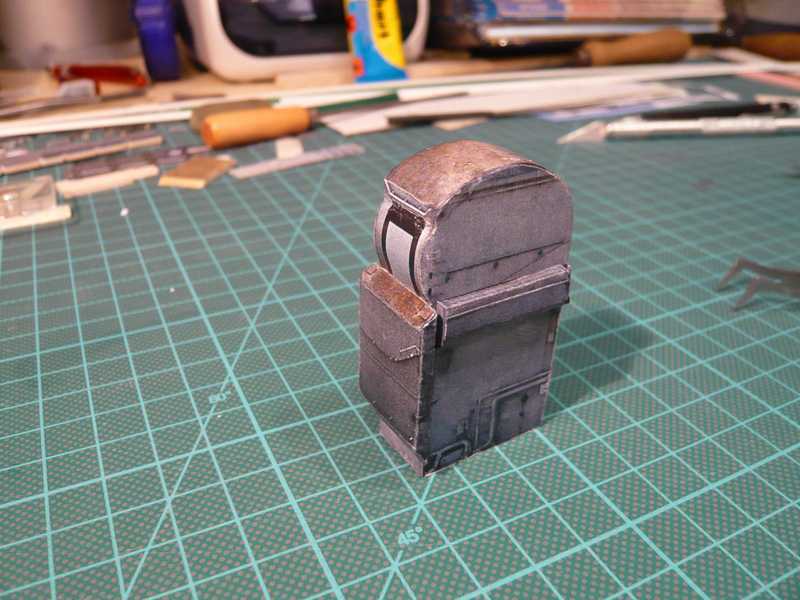 6,2x6,8 mm with a cutter from a piece of paper and glued then a somewhat larger piece of the priming ribbon over it. 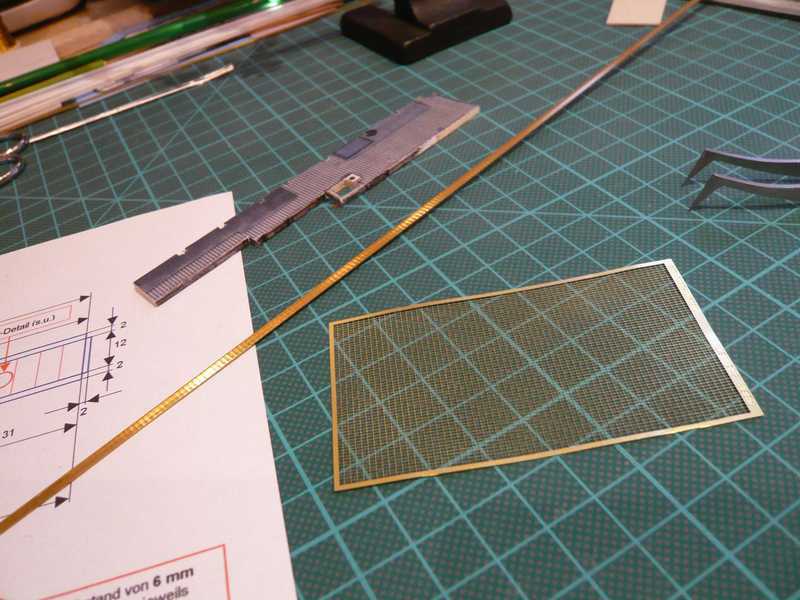 Afterwards I drew the outside edge (7,5x8 mm) around the lattice opening, and cut these out then carefully, from which finally a framework strength of < 1 mm results. And after the concluding brushing finish the work was then achieved and had to be glued only carefully between the 1x1 mm of bracket sections in Bay 7. It is in the long run only a small detail, could one now mean, who is hardly still noticeable in the MLP wall, but rounds it somehow off nevertheless the overall view, finds I. And in addition I wanted to try myself times at such a tiny structure. And now only the Side 1 stands so completely naked and without everything there, but that will now soon change also. But there is a lot of tiny equipment to build. Here is a picture of the real thing in full beauty. 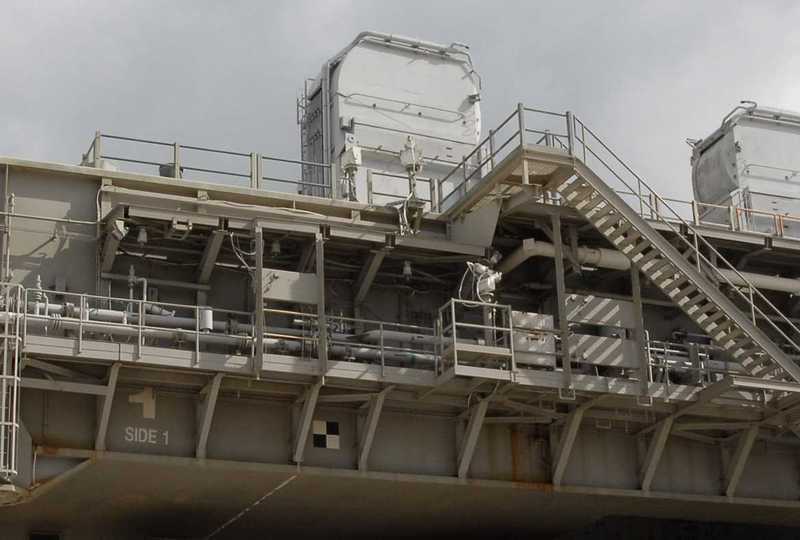 There are already alone four Access Platforms in different height with various equipment, walkways, stairs, railings and a lot of pipes and valves. But first were to be attached into already well-known way the vertical reinforcement profiles, thus a comparatively rather lighter exercise. 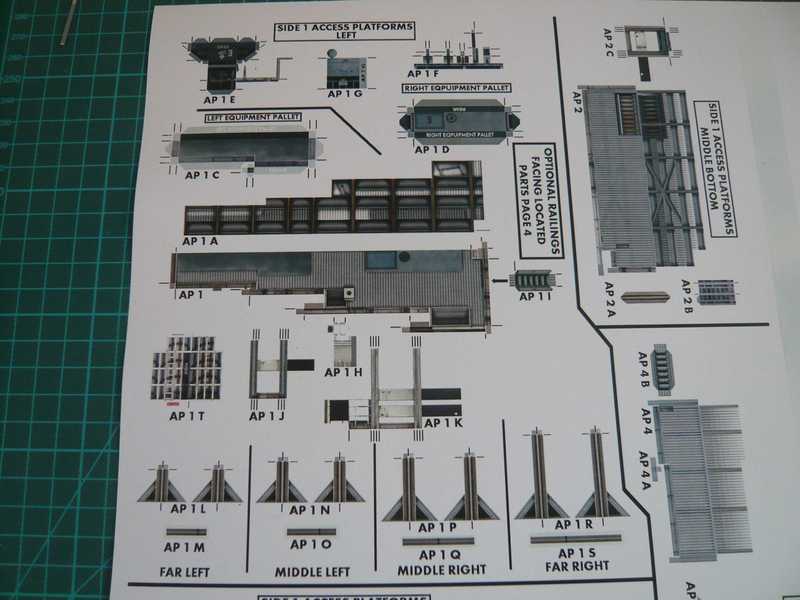 And thus to the longest of the four Access Platforms, that is at the left side, above the MLP-1 No., here in the original. Actually it should go on with the Access Platforms at the Side 1, and I had begun thereby already. 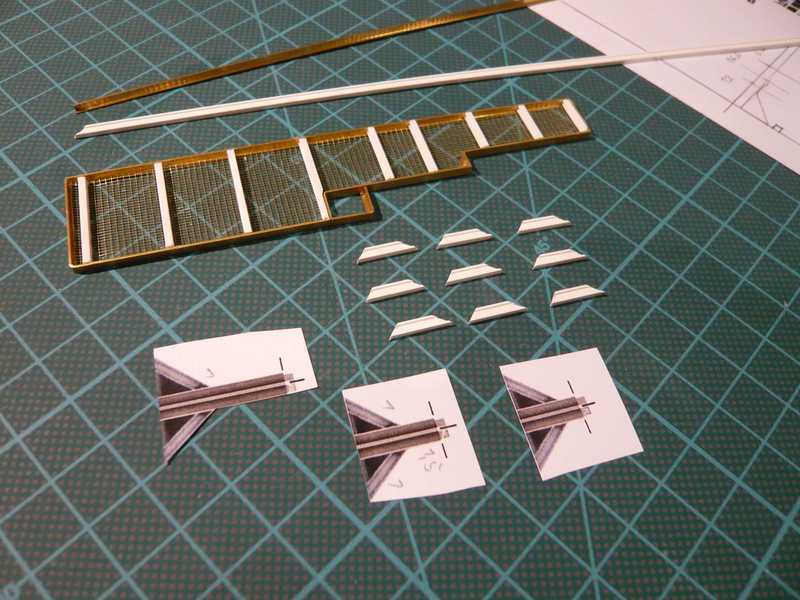 I strengthened the upper section of the platform (in front) again with 2 mm of Balsa. Behind it the bottom side of the platform lies. 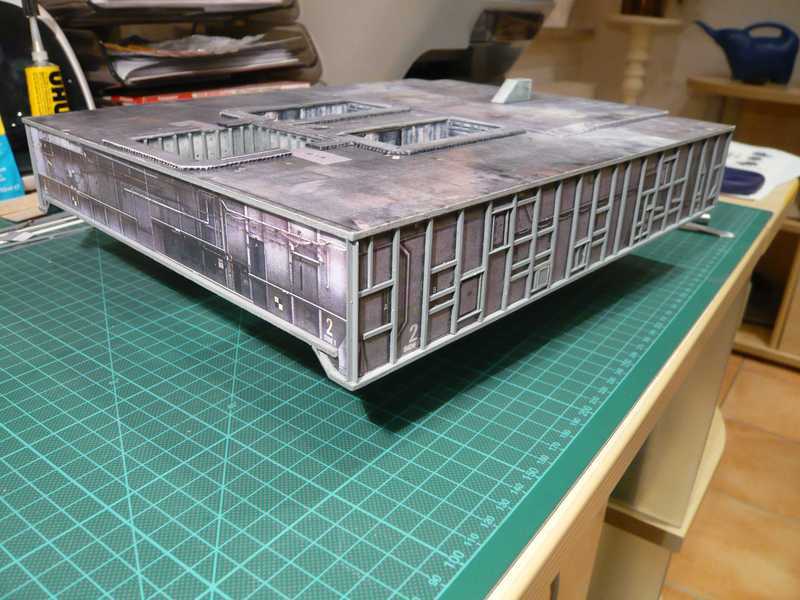 The two recesses on the right and left were suggested in D. Maiers kit template only as such, what does not please me however, and therefore I've cut it out. 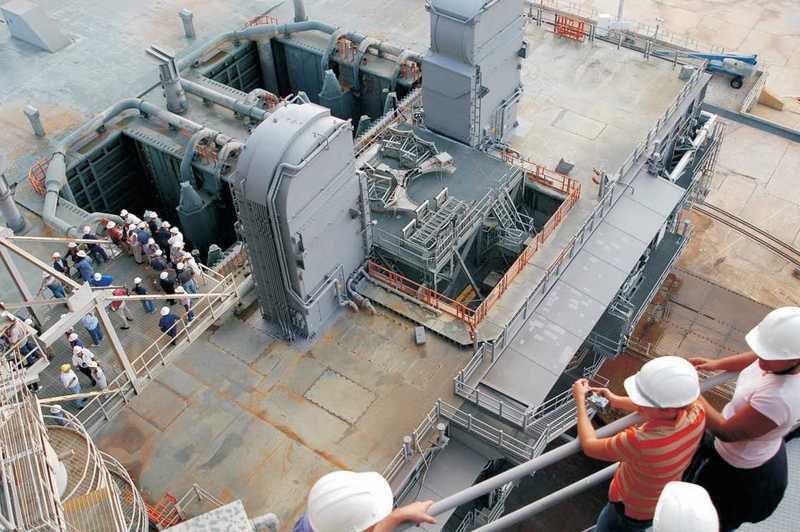 Above the right recess (arrow) a long stairway leads to the upper deck (0 Level) of MLP-1. Since I found out however in the meantime, that there was no stairway at the MLP-2 with the STS-6, and therefore I had to omit it. 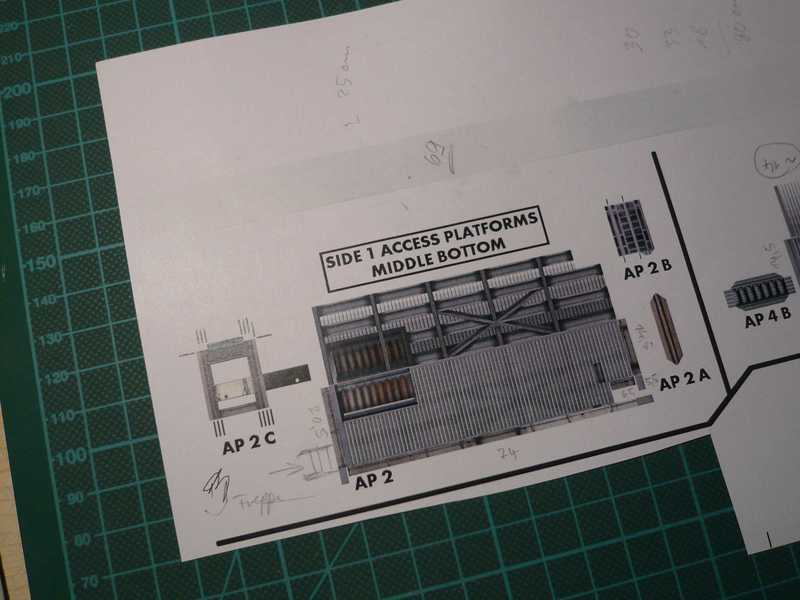 With more exact regarding of the platform parts I've got the question, how the platforms in reality looked, whether are closed, or whether it concerns broken through gratings, which I thereupon followed. 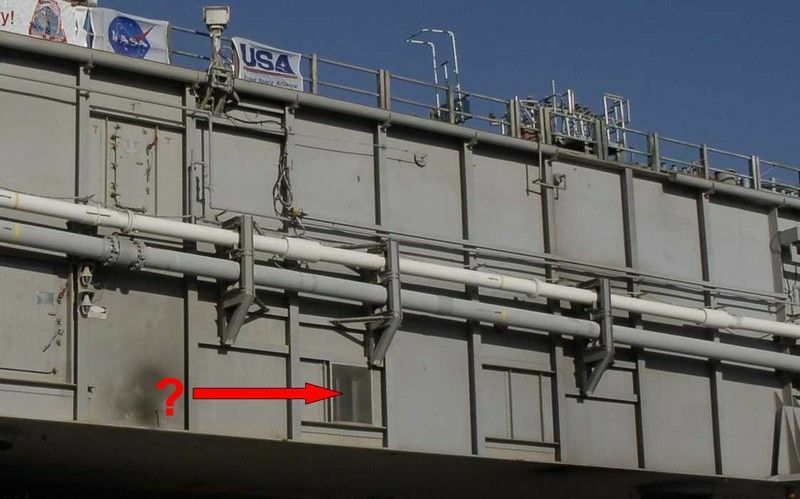 After I looked at myself some NASA photos exactly, I found out that it concerns open gratings, as one can see in this photo. And after I had found that out, I had following idea: Why I should not try whether the top sides of the Access Platforms would drive themselves out not also as gratings leave. 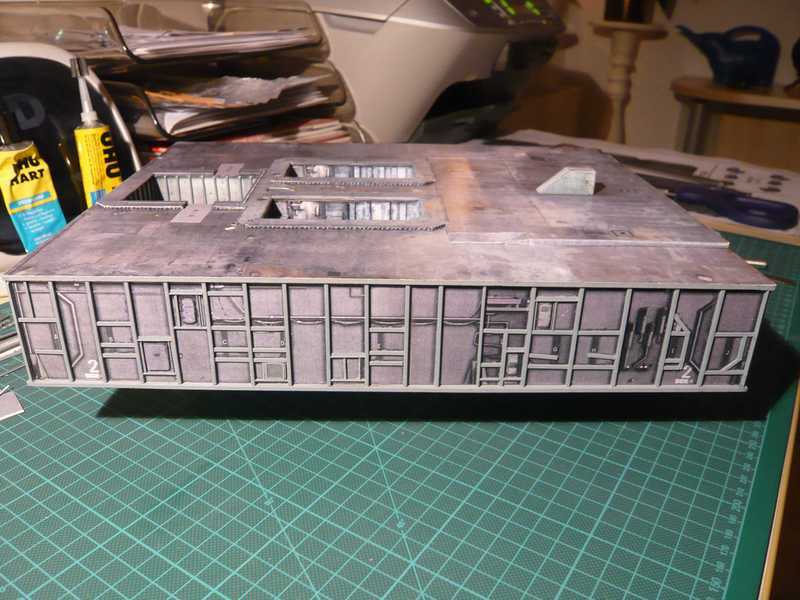 And there I was with my thoughts immediately again with the small ventilation screen on the Side 4, which I had scratch built from a ribbon. I am some more considering, whether I am to really do myself the expenditure, but would already provoke me that. And therefore I'll plan that next times. 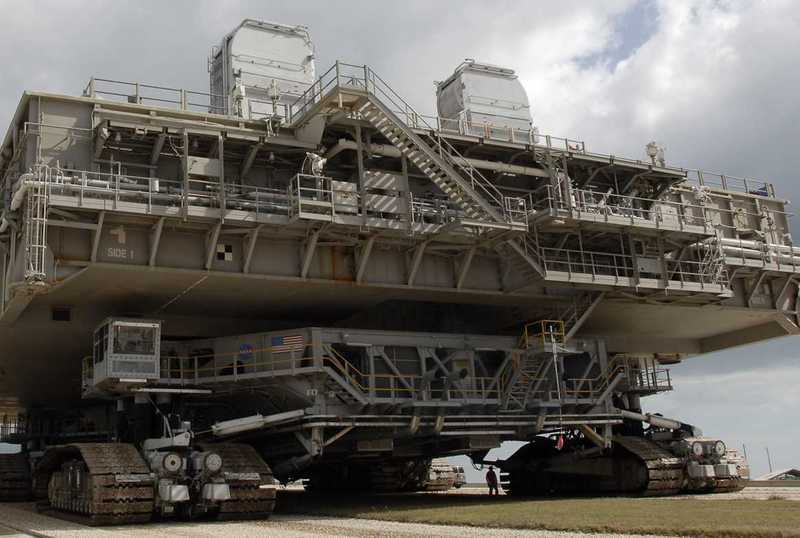 If it folds, I could build all other Access Platforms also in such a way. 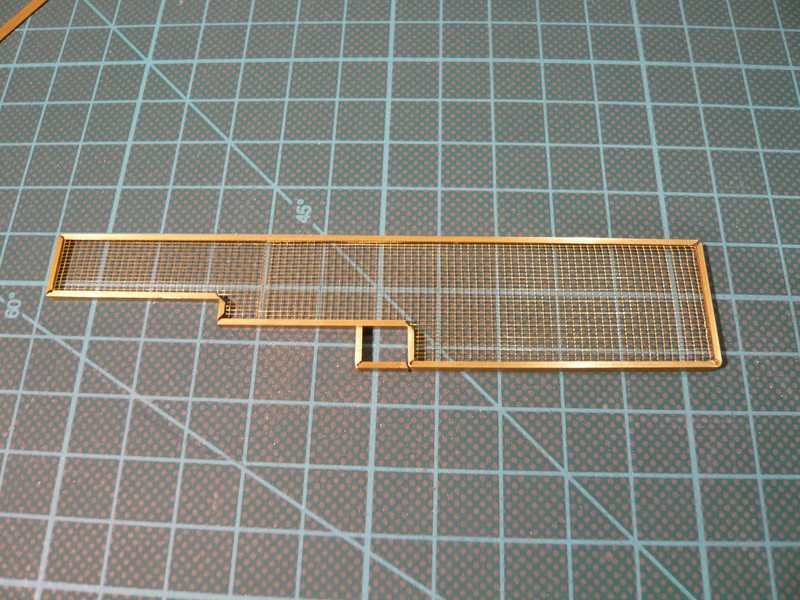 That however would mean that I must build also the underbody for the gratings themselves, and for it I need the necessary profiles. Those are essentially I-beam sections, on the basis of photos I estimate approx. 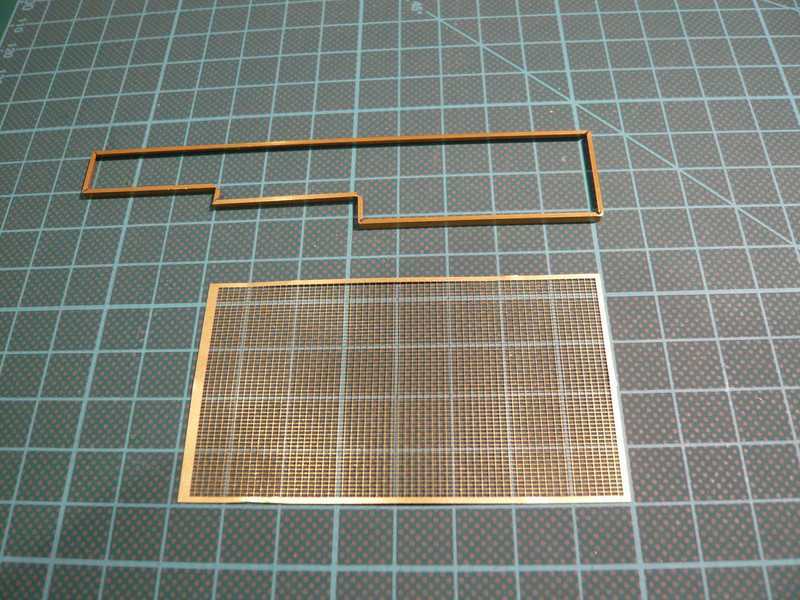 1,5x2,5 mm (1:160). 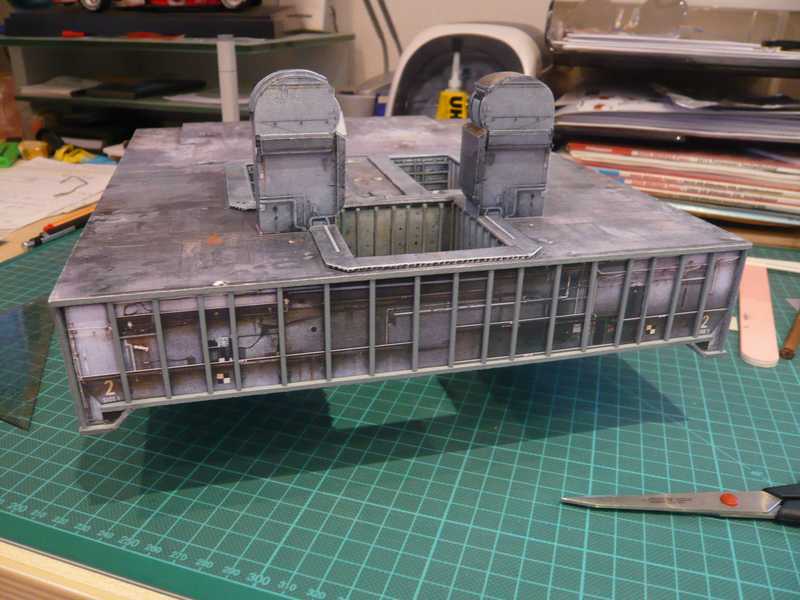 And then it would also present itself to likewise build the struts from plastic profiles and do without the paper struts. Completely so fast I will be able to start thereby not yet. 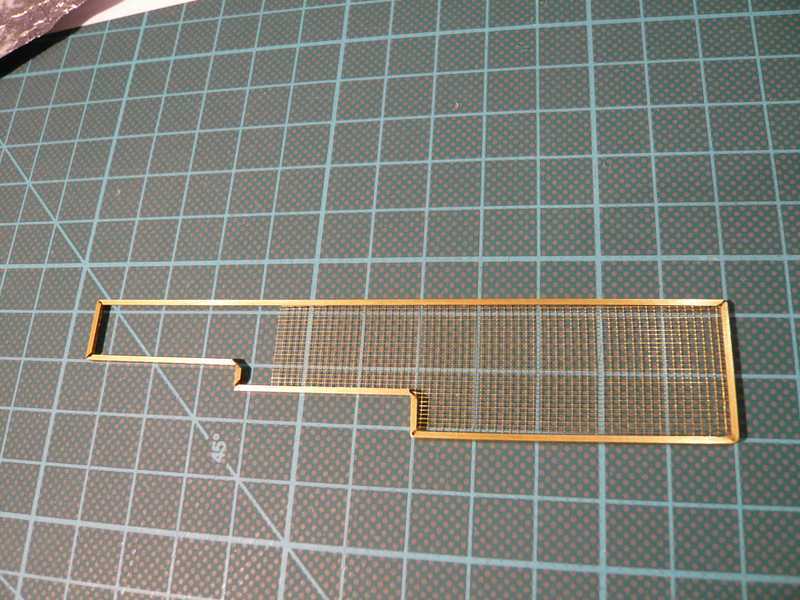 After careful consideration I mean textile variant envisaged with the ribbon for the gratings probably nevertheless to reject and the walkways instead from metallic grating to make. That would then in any case be the more solid and more durable solution, as I find. Last edited by spacerunner; 10-11-2016 at 05:57 AM. Then I already procured myself the first profiles for the building of platforms, with which it could to start then shortly. 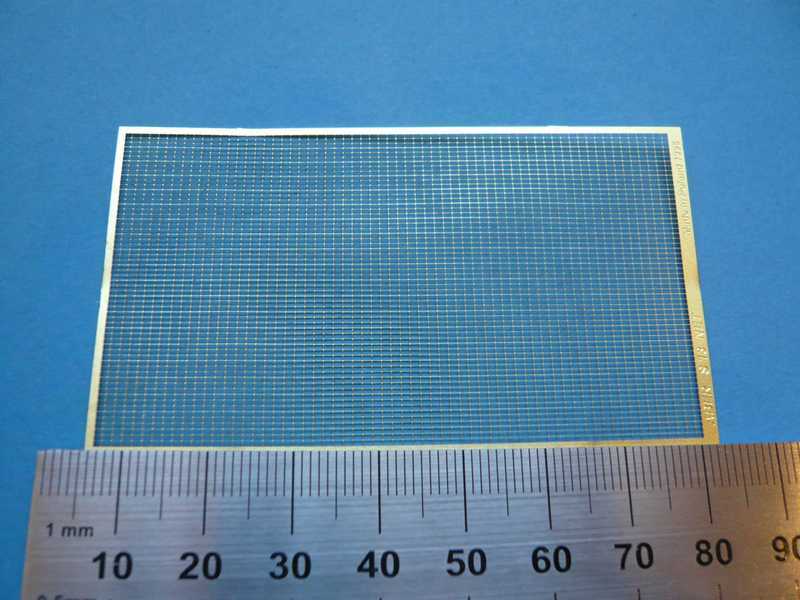 Thus the mesh size should amount to therefore in the original 12.0x2.4 cm and in 1:160 0.75x0.15 mm. 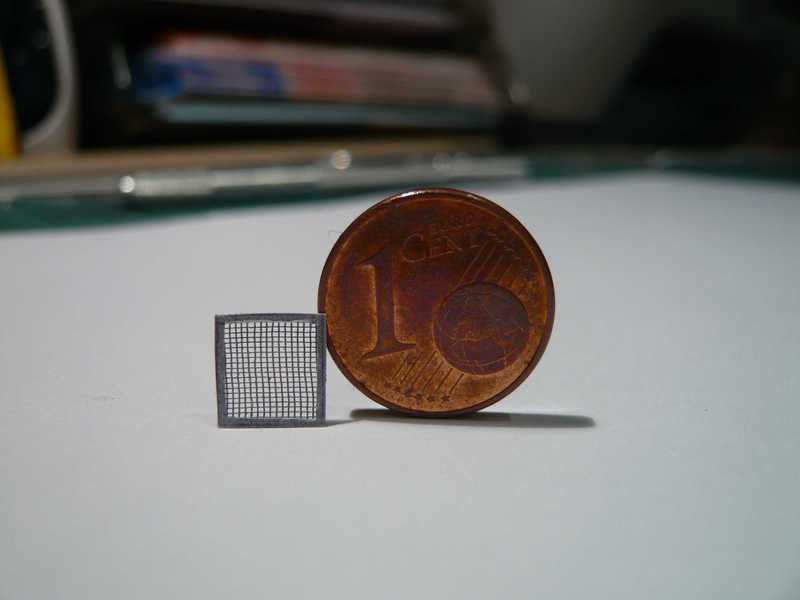 Since however so fine-mesh PE plates are offered by no manufacturer, I decided then for a mesh width of 1.2x0.7 mm, which corresponds to the original at least in 2nd approximation. 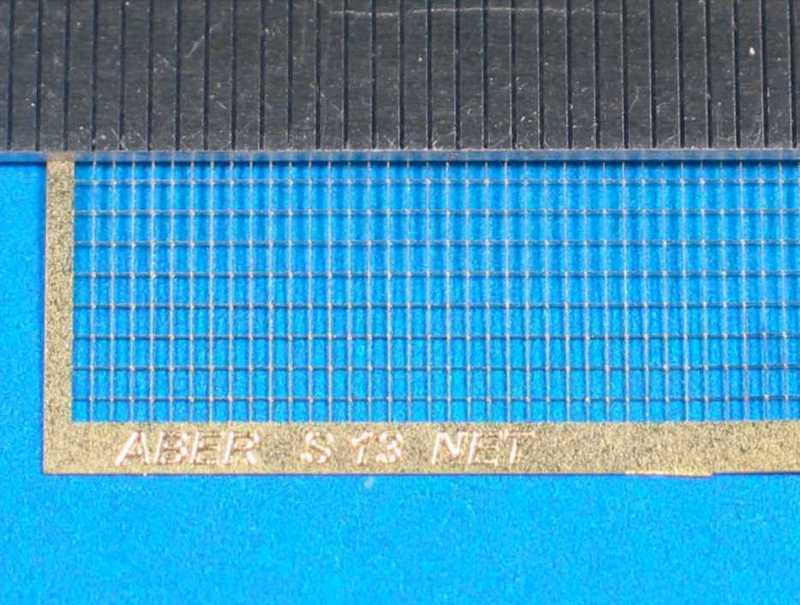 Therefore I selected now and ordered gratings with 1.2x0.7 mm of mesh size of the Polish company ABER, for which I wait now. So that it precedes nevertheless, I turned, i.e. now to another important equipment of the MLP the two Tail Service Masts (TSM). 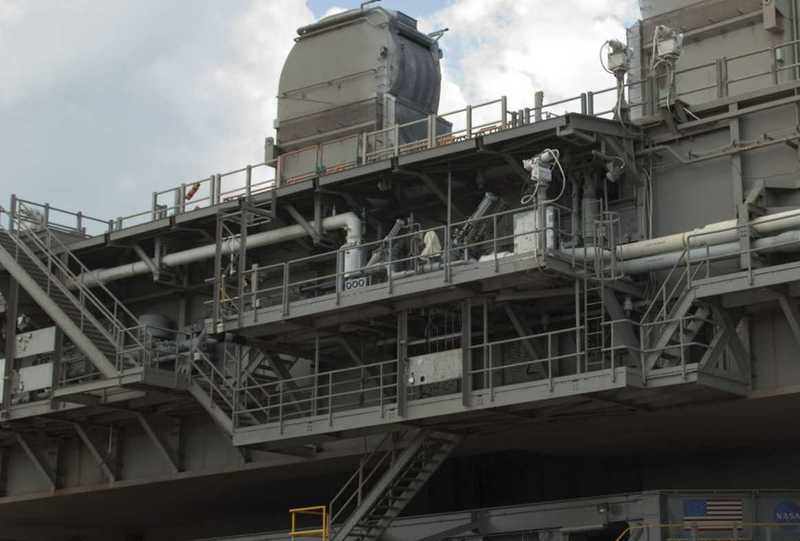 Those are the box-like things to both sides of the SSME exhaust hole, by whose interfaces the shuttle is connected with the MLP. 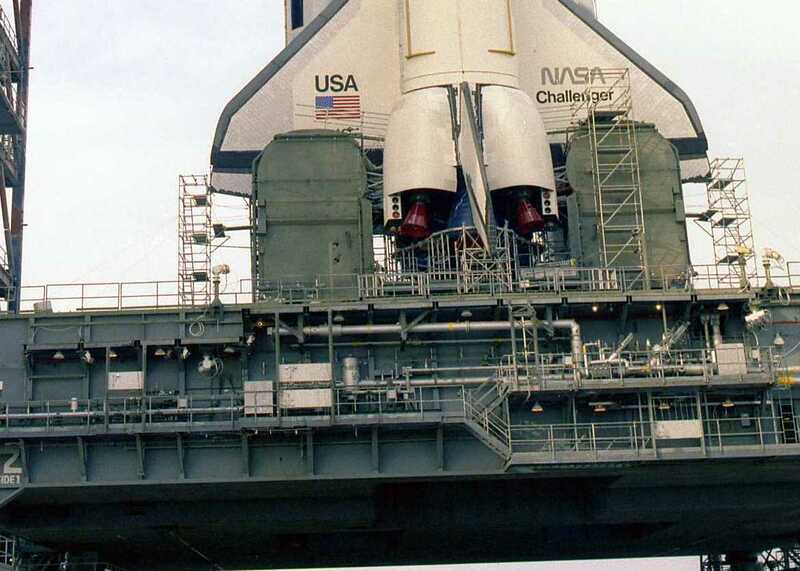 Over it all important supply lines and connections run, via which the shuttle stack is supplied with all necessary media (energy, fuels, data etc. ), which are needed during the mission. Although both TSM's from the outside form look almost alike, they differ nevertheless in some details, which will still have to be seen. I began first with the right TSM, by which the pipe for the liquid oxygen (LO2) runs. In the building guidance all steps are in detail illustrated. 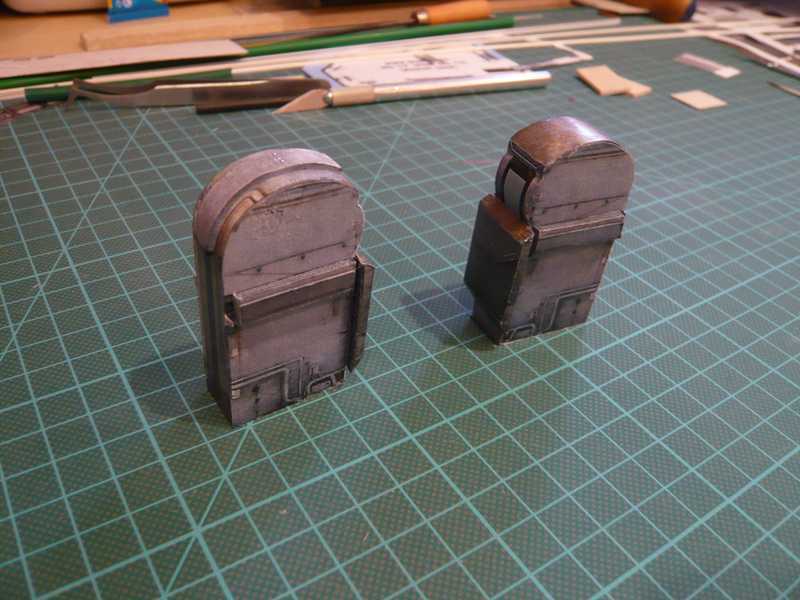 First again reinforcement pieces for the two TSM bases had to be made, to which I had used Balsa and cardboard in proven way again, in order to come on the necessary strength. 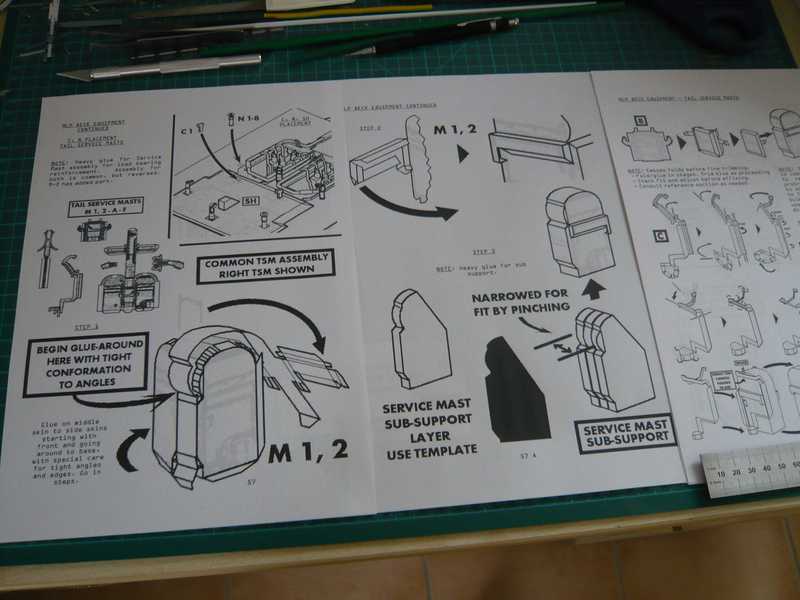 However the template of the paper kit (black) proved as too inaccurate and/or useless. 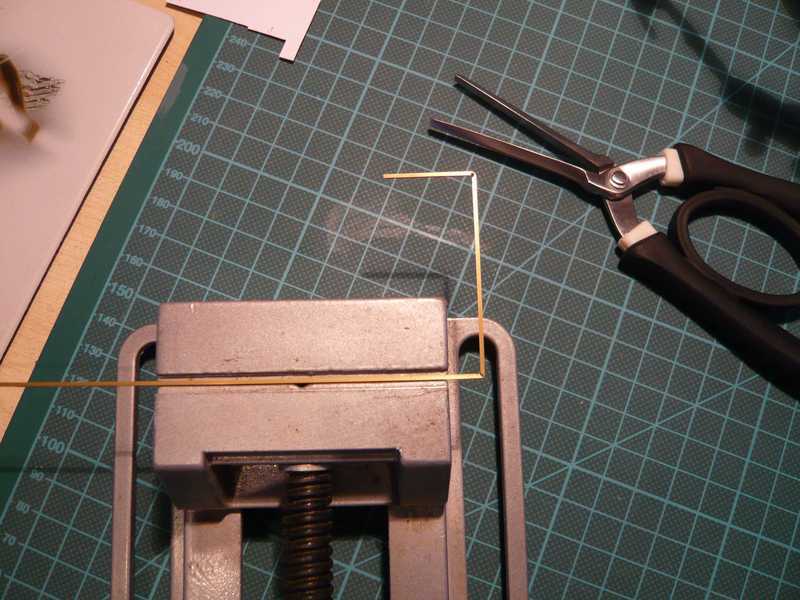 In the next step the cores were glued into the paper covering. 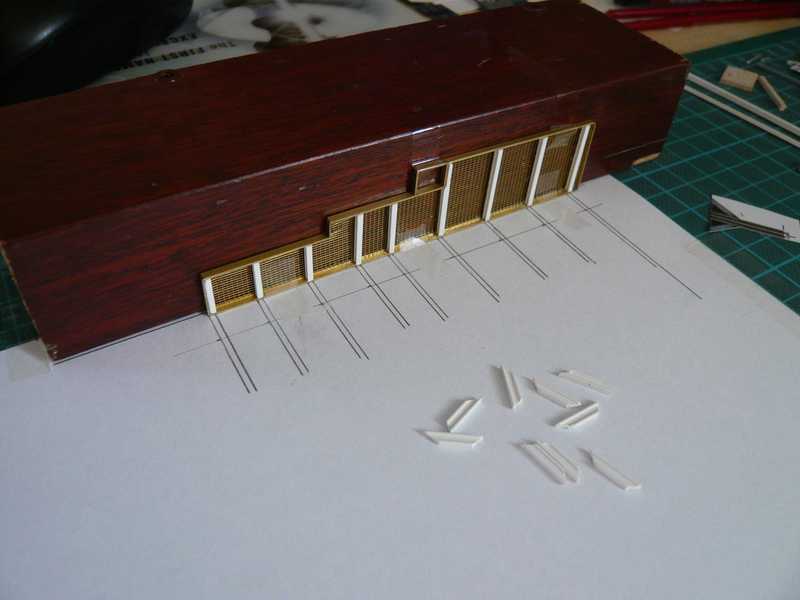 In front of the TSM lies one of the two opening flaps with the Balsa reinforcement, which must be glued still in each case on the dark strips on front site and back. 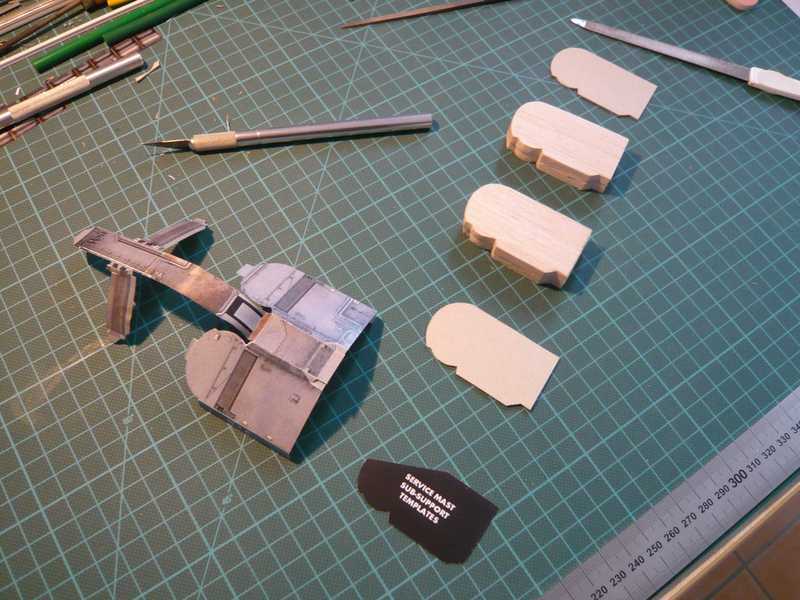 The two opening flaps are not glued to yet, since only still the larger cover (M1B on the sheet above) must to the left TSM side to, which projects laterally, to which then the opening flaps directly attaches. The bizarre thing (M1C) in the center are parts of the pipings, which I will however not build of paper, because as a too reckless exercise appears to me, whose failing I would like itself to save gladly. That can be made surely more elegant from plastic profiles and wire, thinks I times. The orange parts right beside the TSM are to show one „the plug “, whereby I do not realize myself however yet whether I will build those. Thus I must anyway still wait, until that will be finished shuttle (1:144), in order to see whether it would then still fit between them. 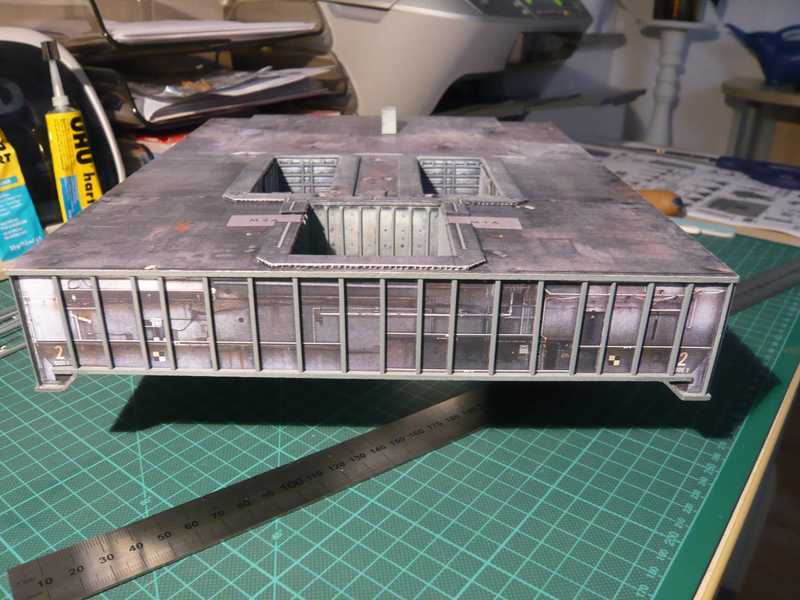 Here however first again the first TSM, still without decorating details such as pipings, cable, ports, etc., but at least already with the opening flaps in front and in the back as well as with the lateral cover to SSME chamber. Then there is a small difference in form of a curved hood, which pulls itself over the TSM curvature to consider with this TSM. 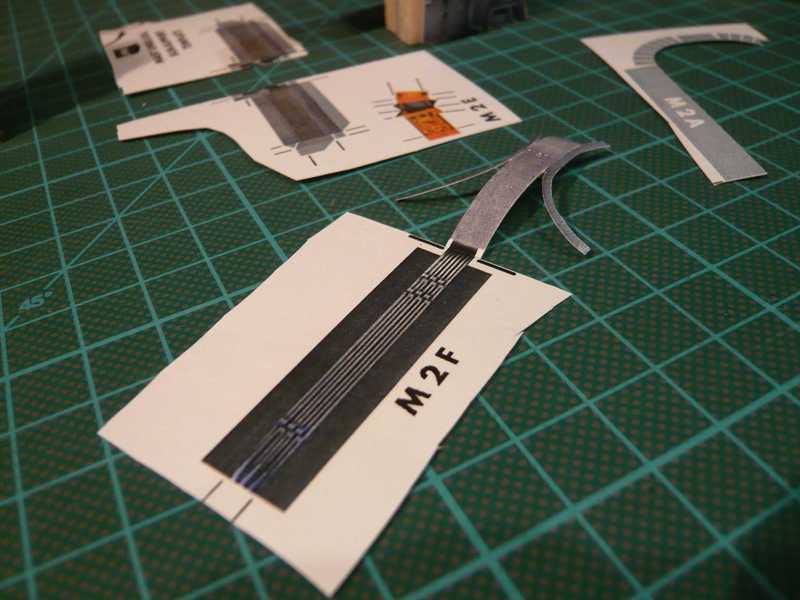 This curved hood (M2F) exhibits a lamellar extension, which is a Cable Tray according to D. Maier's kit. You just keep going with all those tiny details....to me that's where the passion for the example pays off! Amazing work Manfred! it get's better more and more...! Thanks Yogi, Bill and Michael for your nice words. You need a lot of patience for those tiny details, but in the end it is worth the effort, I hope. Last edited by spacerunner; 10-11-2016 at 05:58 AM. 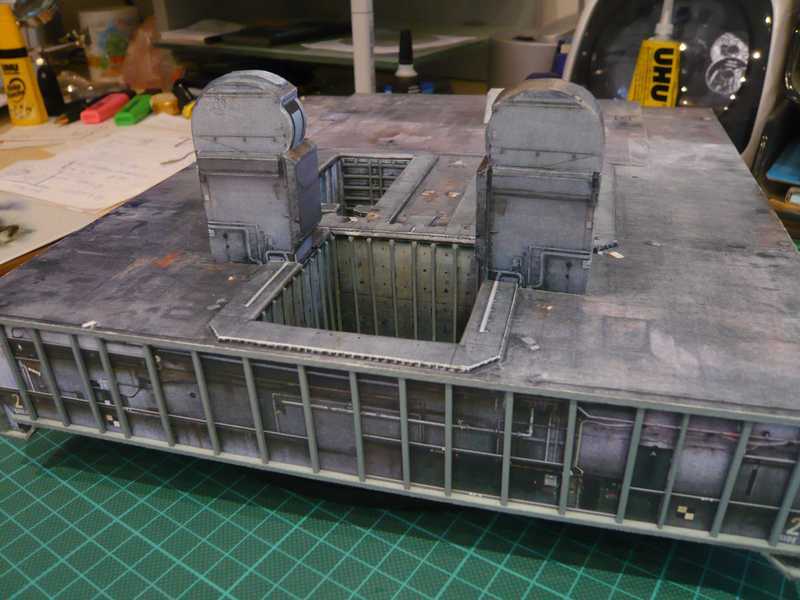 In the meantime now also the other TSM is including hood so well finished, up to the pipings, cables and ports, and so on. 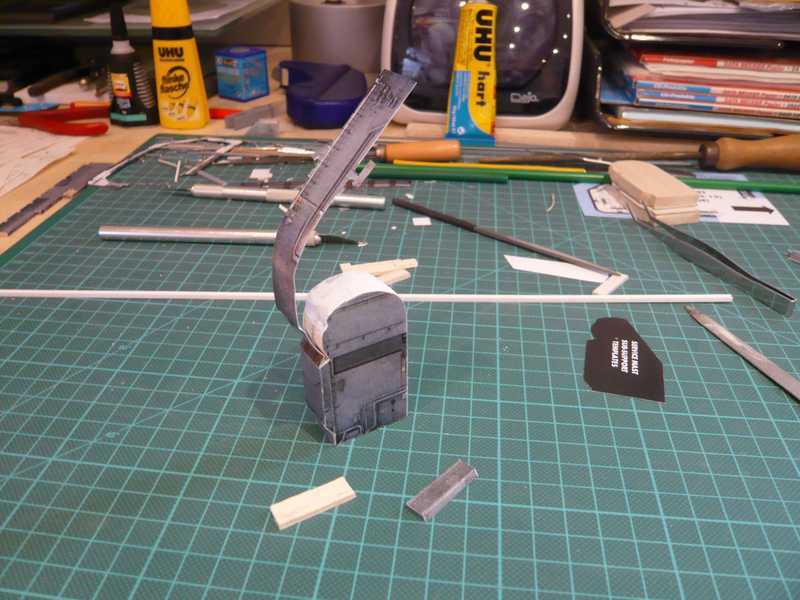 And therefore I already made a first test fit apart from SSME chamber. 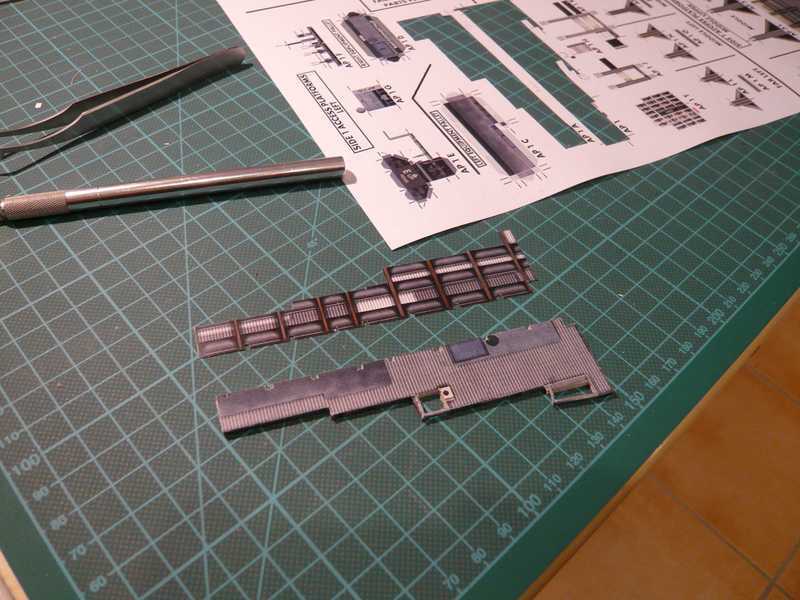 To firmly glue together I did not want the TSM's however yet, since the missing pipes and so on can adapt and be moved probably nevertheless more skillfully, as long as one takes the parts into the hand and as desired to turn and can turn. and accepts thereby now ever more clearly his salient courses. was one then however nevertheless the opinion that this cannot be the optimal solution. Since the thicker pipe has not continuous the same diameter, but should be improved itself within the front range before the Umbilical flap rejuvenated, as in the picture is to be seen here. 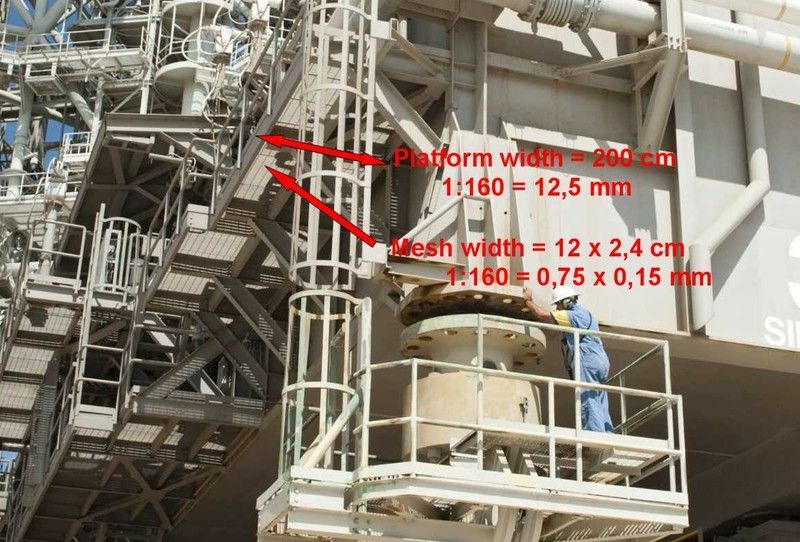 While the piping mechanics at the TSM must wait still for the correct pipes, it could go for it with the Access platforms further, since the grating PE plates, mesh size 1.2x0.7 mm, in the meantime were delivered by MCM Marketing. 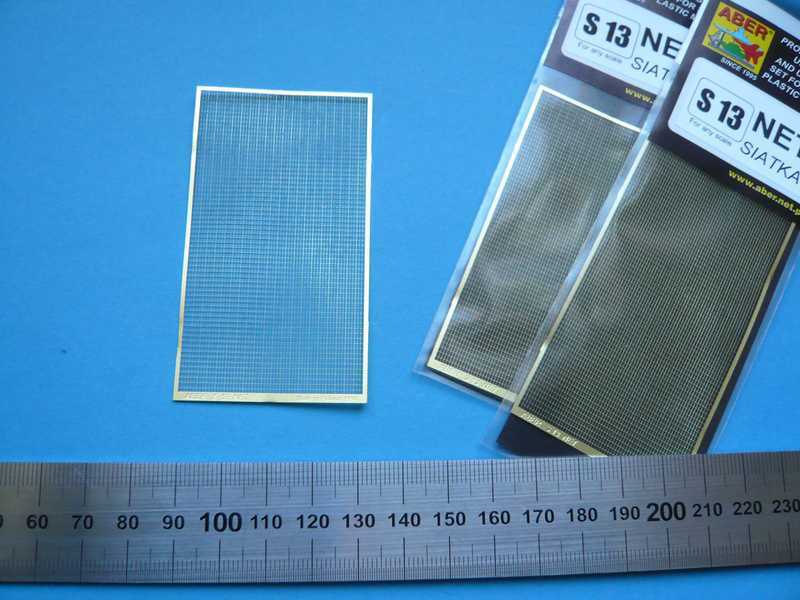 Those are actually as small with 78x44 mm, as announced, do not look bad for it however. 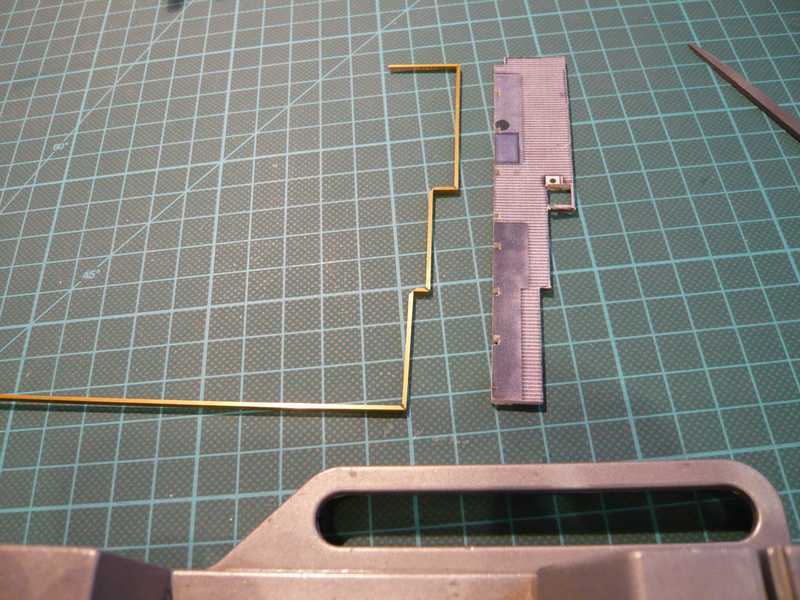 The brass L-profiles 2x1 mm lay already some time in the camp. 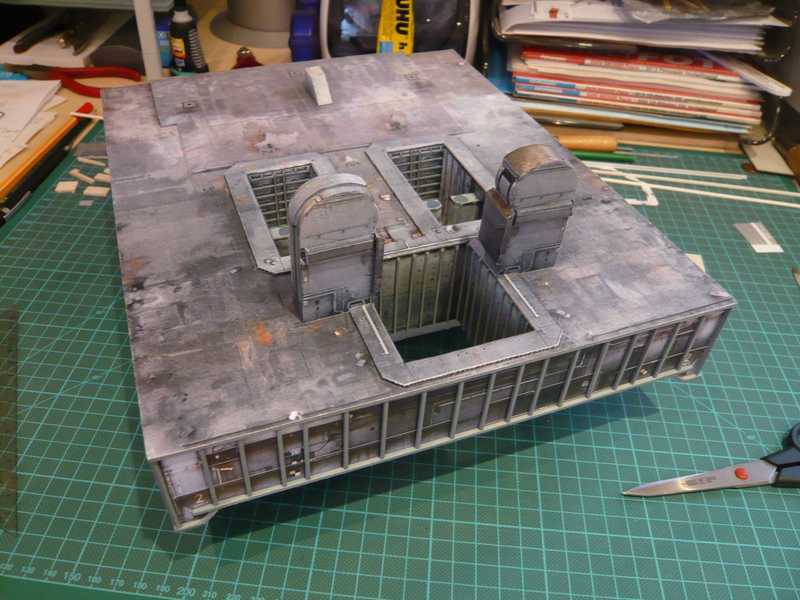 Now it also can go finally further with the Access Platforms at the MLP Side 1. Last edited by spacerunner; 10-11-2016 at 06:09 AM. 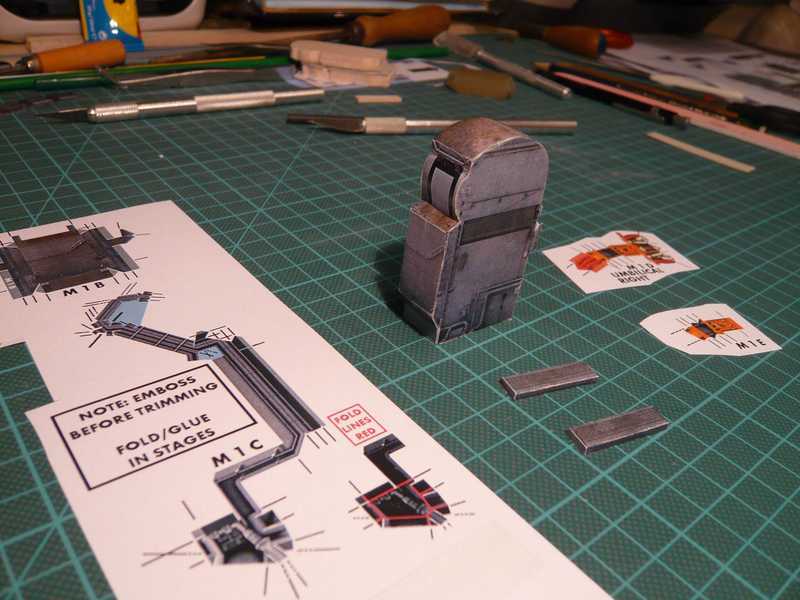 now I have to change the materials from paper to metal and sheet for some time. Let's begin with the first Access Platform AP 1. 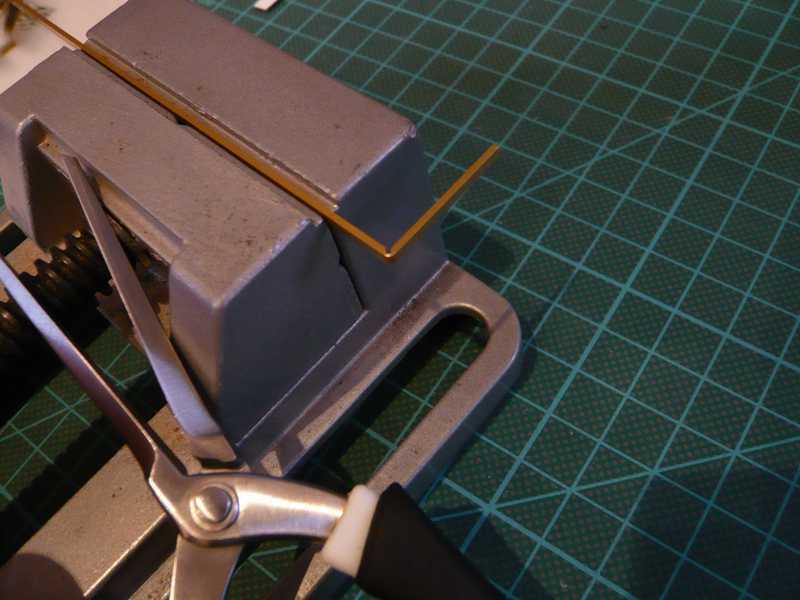 Therefore next the measures of the platform marked out successively on the L-beam (2x1 mm), at the corners the narrow side (1 mm) carefully in each case a miter was in-filed, and the first bend already was done. And the first framework was finished in principle already. 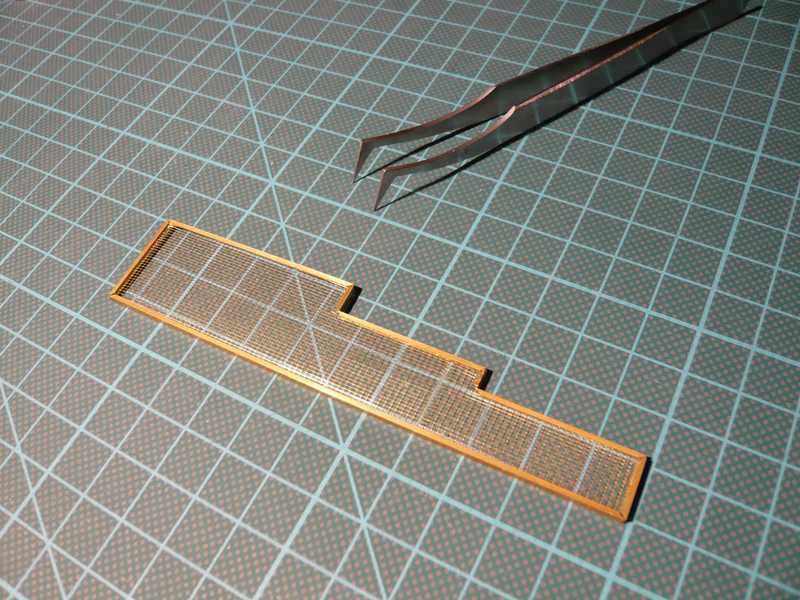 And therefore directly to the PE-plate with the grating, to which now the framework measures became to transfer. 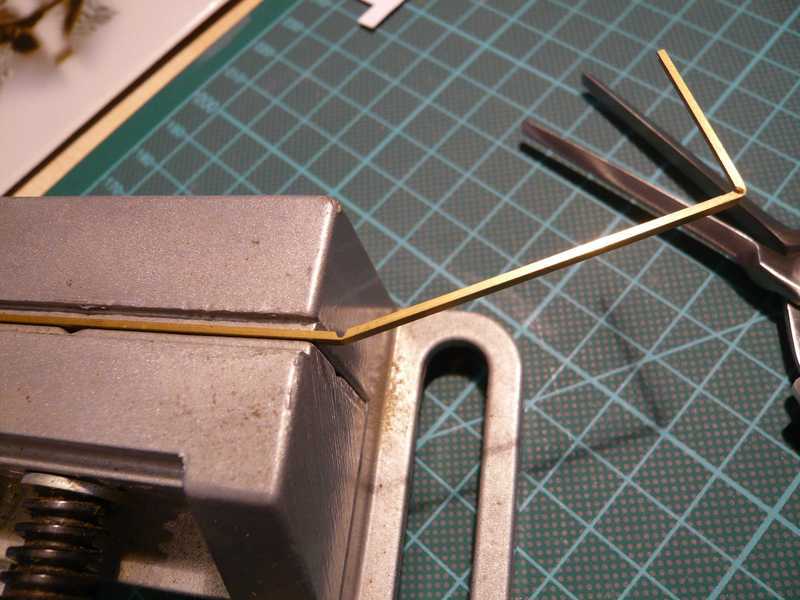 Afterwards the first part of the grating was carefully cut out, fit in within the frameworks and glued together with Superglue. Now the missing rest of the grating was to be only installed, and the first Access platform was so well finished already, up to the small framework for the camera landing. And the boys created that just before the end of workday. 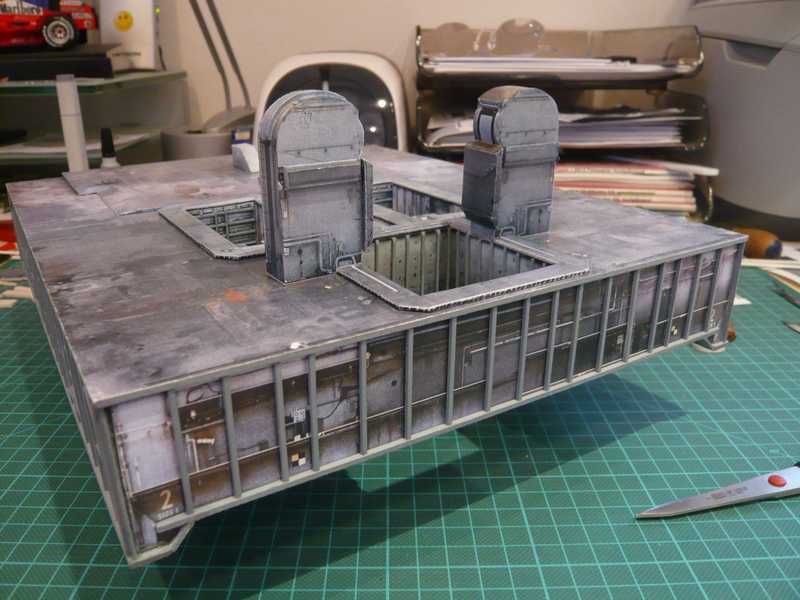 Next then the underbody with the girders and bracers is to build. 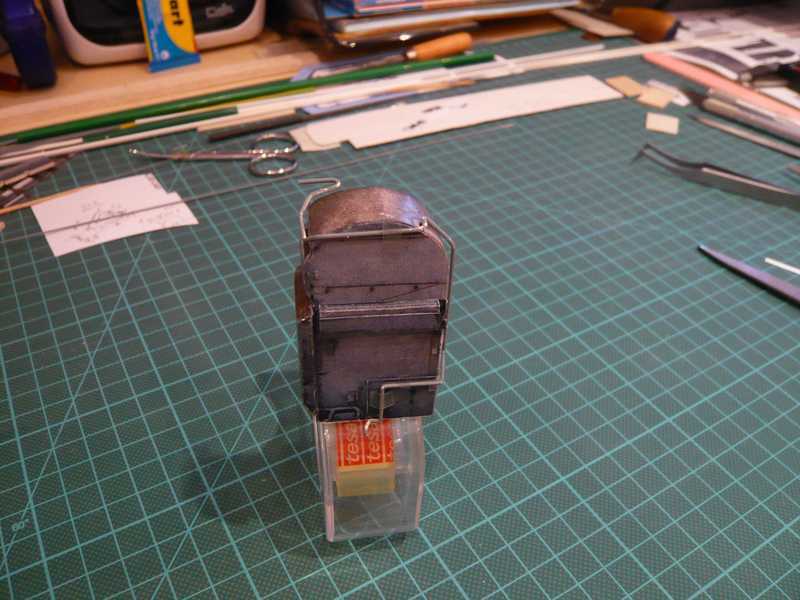 Since I did not want to use the shown platform brackets from the Paper kit, plastic profiles were used. 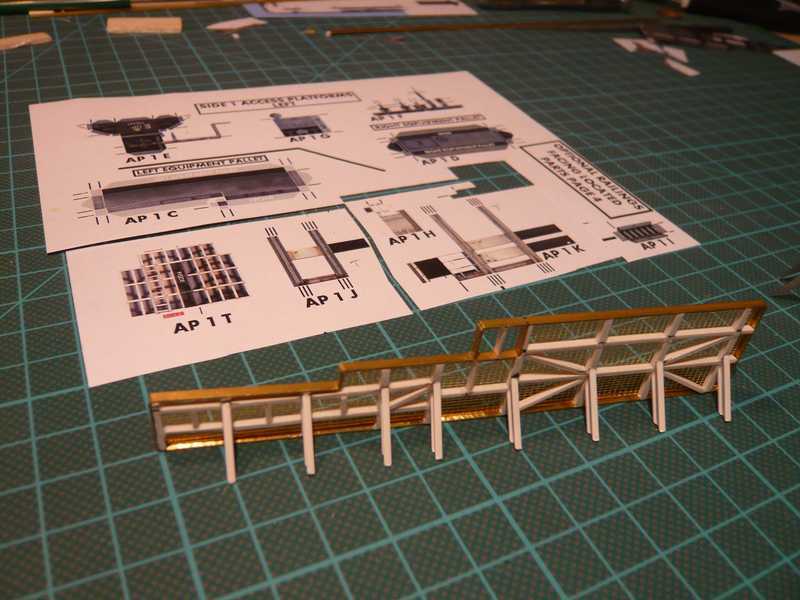 I hope the real Paper Modeler will turn a blind eye to me. 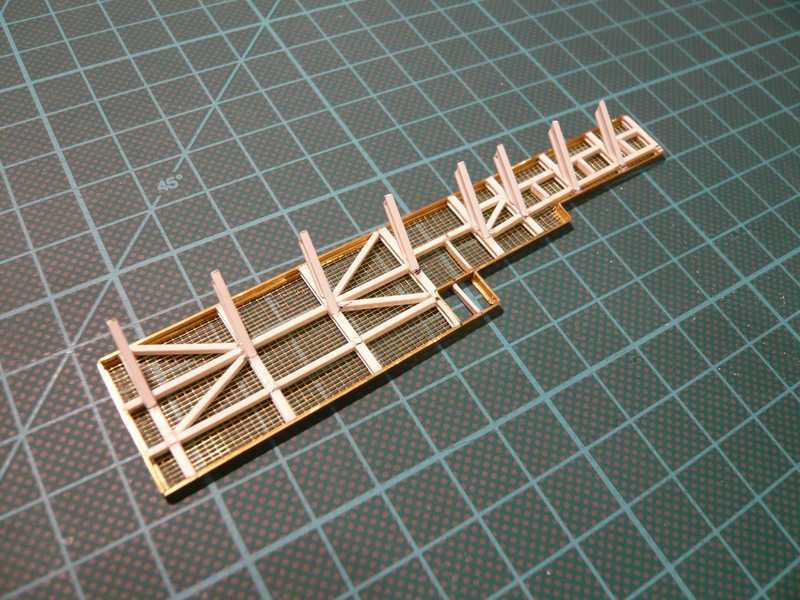 For the girders I used now H-beams 1.5x1.5 mm, which conclude the frameworks downward concisely with the L-beam. 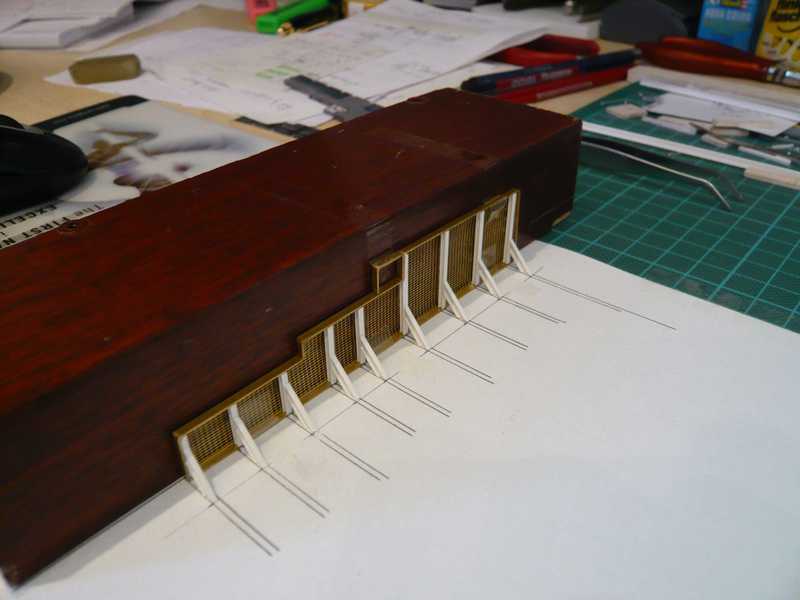 The planned I-beams 2x1,3 mm would have over confessed downward over the frameworks. 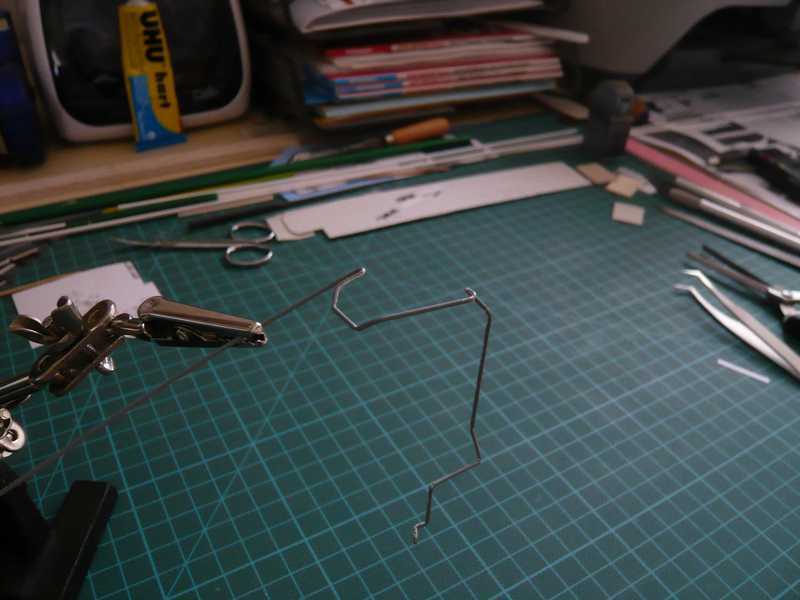 And now it can start, and always carefully the bracers with the tweezers to snap, so that they do not jump aside again, with Superglue dabs and then fast and accurately at the characterized places diagonally against the platform carriers glued. And after the 9th bracer it was then finally done. And because it went so beautifully, directly still the first cross-beams were by right cut and adapted, which can be glued now. Well yes, sees already completely properly out for first, I think. In the meantime also the remaining bracers at the first Access Platform were installed. Who looks exactly, will recognize that on the right of outside the last diagonal bracer is missing, which I removed from the following reason again: There was not completely clear me so far, how this bracer is installed, because at this place of Side 1 there is no vertical reinforcement profile, at which all remaining diagonal bracers push away. As one in the next photo clearly can see (arrow), this last bracer is somewhat shorter than the others and supports themselves against the diagonal props of the Pedestal support off, while all remaining bracers prop away against the vertical reinforcement profiles of Side 1. Therefore this bracer can be installed only if this Pedestal support at the corner to Side 2 will be installed. 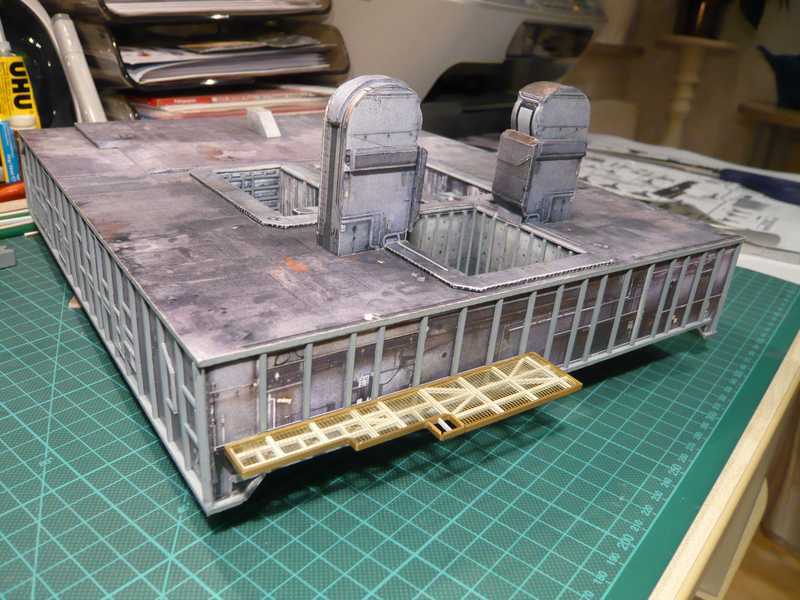 There are a few small props in the original platform still, but without those I can live, particularly since I think that it looks so already acceptably. 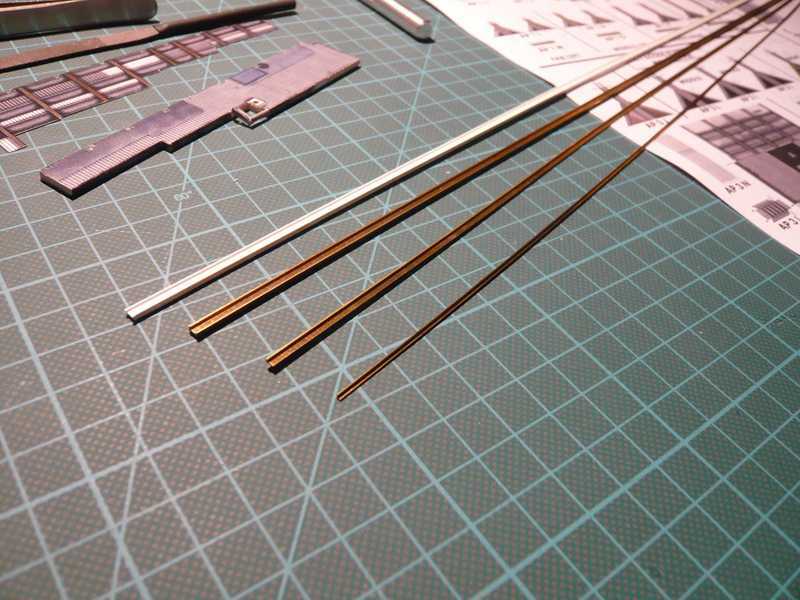 In the end it was anyway already rather stressful with the small parts. 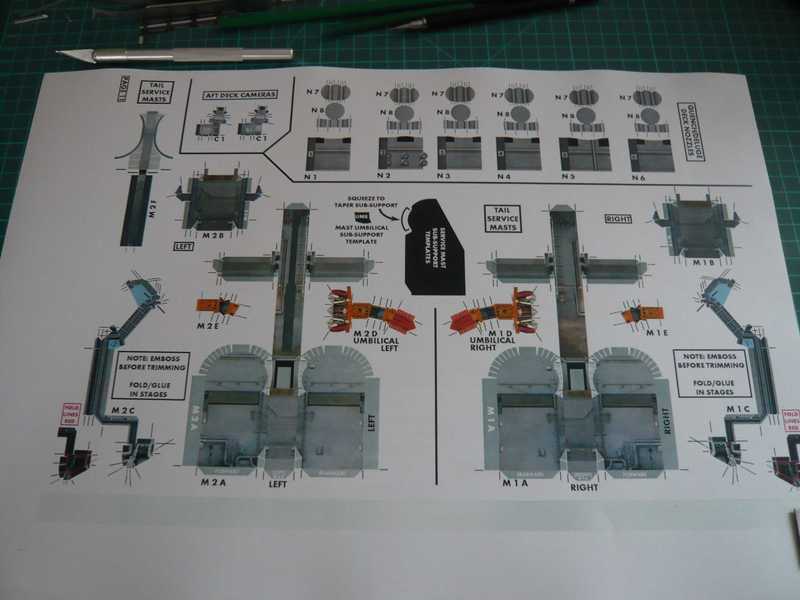 Then I already out-looked for the sheet with the accessories parts, that would then next be the two Equipment pallets AP 1 C (left) and AP 1 D (right), on which then still different armatures will be installed, among other things a first camera (AP 1 G/H). And like the first try-on shows, the platform fits nevertheless already completely well to its place. 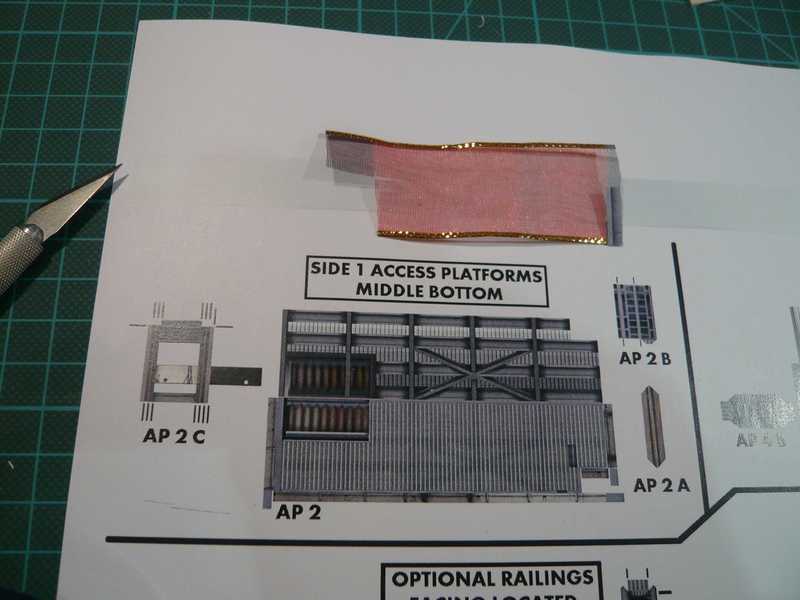 And already it can go on with the next Access platform (AP 2), that is the lowest platform at Side 1, of one can arrive over stairs at the Crawler. 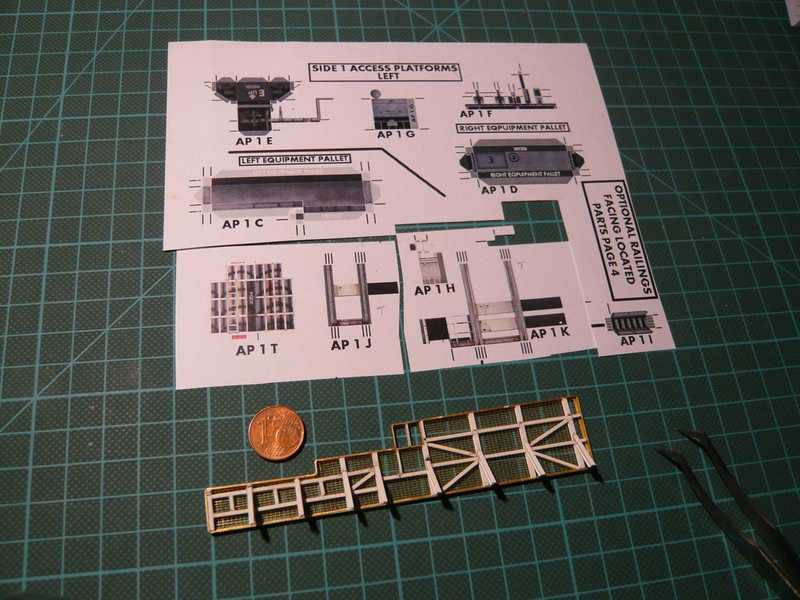 Here is the appropriate kit template, in which some, like this stairs to the Crawler, is only suggested e.g. 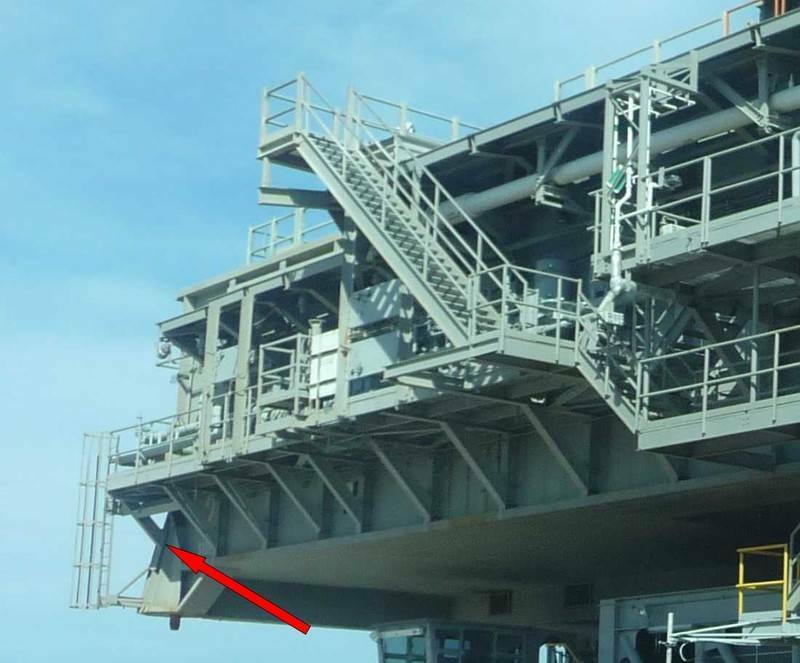 Okay, who does not build the Crawler, this stairs do not need, but the opening is nevertheless present, and it reaches nearly up to the center of the platform. Last edited by spacerunner; 10-11-2016 at 06:11 AM. You have a Museum piece being born here! Beautiful work! !